I'm hoping anyone out here can help out !? Would anyone out here know the full weight of a 2018 BMC Agonist 01 One medium size bike? The stock middle model in large was like 12.8kg... Is it called 02 one? I really like it though. I guess it's just sub 12kg. I have a BMC Agonist one 01 (Size XL). I haven't weighed the full bike yet but I will do it when I get home tonight. 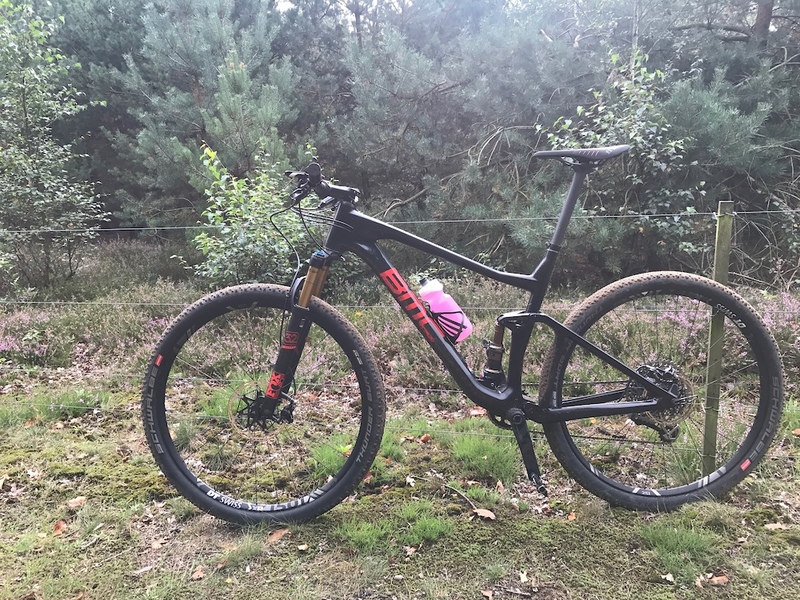 The FS-I black inc that I traded in for this bike is lighter but the ful suspension frame adds so much smoothness that I think I will be faster in longer races. 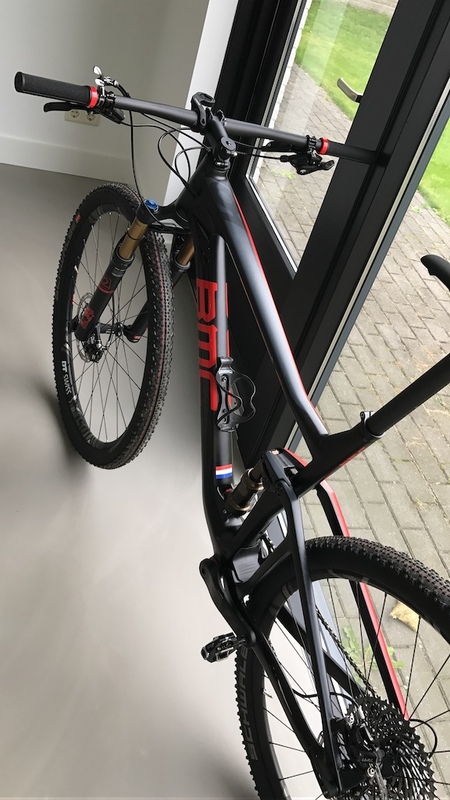 The frame of the BMC is beautiful, the paint finish and design are really cool(quality of paint job is MUCH better than the one of my cannondale). My old bike had ENVE M50 rims and Chris king hubs so the DT set in this is a bit of a downgrade, but I must say that the difference is less noticable then I expected. Some tweaks that I did will make the weight of the bike a little different from standard. I changed the tires to Schwalbe thunder burt 2.25 (notubes) and the grips to ESI grips. I shortened the cables and hoses, and cut the steerer tube, and mounted candy 7 pedals. Last edited by comet on Thu Sep 14, 2017 10:31 am, edited 2 times in total. Please post also your complete Spec incl. size and if tubeless hiw much milk you are using. Did you weigh the tubes if you have them? I just weighed my bike. It is 9,7kg with garmin edge 100 mounted and arundel bottle cage. Quite light for a more or less standard full suspension bike. With pedals? With tubes or tubeless? With pedals, and notubes. I use quite a lot of notubes latex but haven't measured how much exactly. Wow, thanks. 9.7 all inclusive. Impressive. Please post afew more pictures. Very nice bike. Maybe you can post a pic showing the bike hanging on a scale? Just for fun I will write down my specs. Converted to single absolute black 34t m8000 chainring (58g). Saved about 350g by removing front derailleur, chainrings and shifter. BMC mfb02 handlebar and lockon grips was 311 + 83g. Switched to Easton ec70 flat bar 720 and lizard skins DSP grips. Sub 200g. Stem 70mm was pretty light at 110g. Ive got a 10mm longer aerozine one (101g with stock ti bolts). Seatpost 291g was traded for a Aerozine 31,6 x 400 (215g). Stock wheelset was never even used and traded for a too heavy (6% from claimed weight) boost crest mk3 wheelset from actionsports. I will never buy anything from them again. Was expecting 1510g but they came in at 1590g... Mounted a GX cassette to get 10-42 and a ashima rotor in the rear. With racing ralph 29x2,25 (641g/652g) and about 90ml of sealant (for racing purpose) its now at 12kg (size Large) spot on with stages power meter, rib cage 2 (34g), garmin mount, XT pedals (343g). Its a great bike. Didnt want to pay the money for the top one but its pretty "bang for the buck". Frame should be 350g lighter on the top model I think. All the other parts are also lighter of course. Cycles et nature @ instagram claims the 01 one at 10,68kg and the white one at 12,5kg stock. what do you think of the bike, what other bikes can you compare it to? I test rode a top of the line Scalpel, and didn't think it was that smooth, but felt fast. Just not that much better than my 15 year old Santa Cruz Superlight. Hi, off topic but what is the remote lockout? Is it a FOX lockout on the handlebars?